We live in very interesting times. The days of “predicting” are over. No one can dare to think that they are able to accurately predict the future of politics, economics, technology and social trends. Therefore, we live in the age of unpredictability, and it is also the age of dreaming the impossible and then having access to resources that can make that dream a reality. It is most difficult to live in these times – as a leader – because most leaders believe their followers want them to know what is going on, what is going to happen, what the future holds. Leaders believe their followers want them to be predictable and predicting. It should be most exciting to live in these times, if as a leader you find a way to remain leadership focused and leadership fit; if as a leader you grasp the essence of where the world is going, in broad strokes; if you realise that your people don’t expect you to think like leaders did in the past; if you believe and clearly communicate to your people how the world has changed and show them how to act and lead in this volatile, unpredictable and complex world. As I have written before, the age of going on the ad hoc leadership programme every couple of months or years are over. It is not impactful enough to equip anyone for the modern world. As a leader you have to get your mind into leadership space every day, first thing in the morning. When challenges come your way you have to approach it as a leader and as a technical expert. Running a business successfully is more exciting and difficult than even before. It always has been and always will be a daily challenge, though it is more intense in this interconnected world. Leaders need daily inspiration and practical common sense reminders of what matters. Everyday crises come faster and more furiously in one’s direction, which distracts one away from core principles of success. Growing your business is a daily challenge. Every business leader / every leader needs support now and then. Business is the engine room of SA. No matter what your business, staying ahead of the game is critical. Formal education in business, combined with everyday common sense increases likelihood of success. Our economy needs leaders to be business savvy and motivated. If they aren’t they will become irrelevant. For SA to succeed we must bring out the best in all of us, which is the leader in each of us. Young and old must become leadership fit for the difficult times ahead. Nothing we do every day could be more important than awakening the leader inside our employees, our citizens. Catch the vision! Every South African is a leader! SA needs you to be and remain an inspired leader. The alternative isn’t an option. 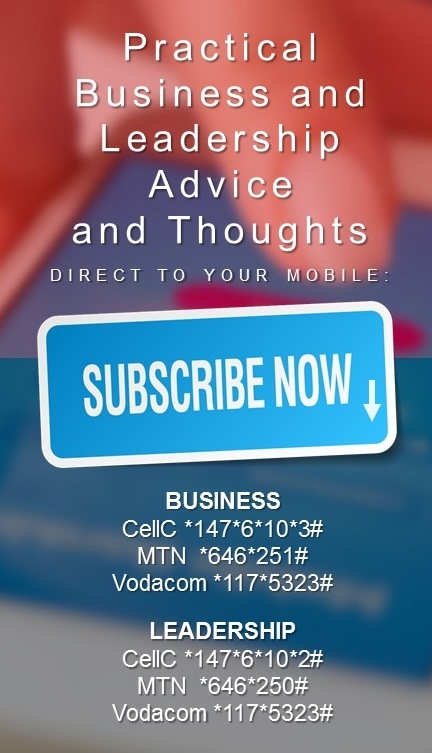 The above is why we partnered with Mobile Operators to bring daily inspirational leadership messages and daily practical business insights to South Africans. We launched this with MTN and Cell C and are working on Vodacom. See insert in this article. Are You The Leader We’ve Been Waiting For?